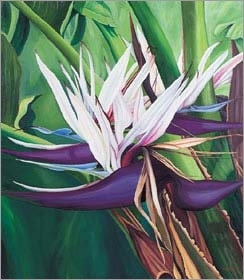 Strelitzia nicolai, the Giant White Bird of Paradise is related to the Bird of Paradise flower, Strelitzia reginae, this close cousin is a much larger plant forming huge clumps of stems to 18 feet. Strelitzia nicolai is from South Africa. You can grow the plant indoors. Sizes normally found are 10" pots 3-4 feet, and 14" pots 5-7 feet in height. The uniquely shaped flower of this exotic tropical perennial resembles a bird's head. The infloresence are composed of a dark blue bract, white sepals and bluish-purple tongue. They flower mostly in Winter and Spring, but they can bloom all year. 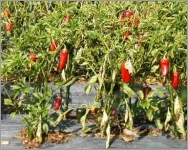 From seeds, plants given ideal conditions will flower within 3 years. The entire flower can be as large as 7" high by 18" long and is typically held just above the point where the leaf fan emerges from the trunk. Fantastically handsome flowers aside, this is also a very attractive foliage plant. 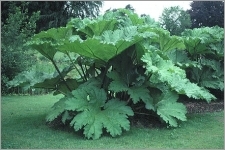 The paddle-shaped leathery leaves are about 6-8' and grey-green.